The annual Chess Tournament was held at St. Thomas Church this past Saturday, March 26th, and it was a great success! With thanks to our instructor, Sarkis Agopcan, his students participated with the spirit of enthusiasm and competition. Everyone received a trophy of participation as a memory of the great day they had, thinking and strategizing among the camaraderie of good friends. All Armenian children from the Tri-state area can participate in the Chess Club at St. Thomas. The seventh grade students of the Kirikian Armenian School of St. Thomas are amidst presenting their “End of the Year Cultural Projects.” Every week, the school will have three presentations. This “End of the Year Cultural Project,” in addition to the “100 question History test” and the regular tests coming from the Diocese, is a prerequisite for the students of the Kirikian school to graduate. Students are free to choose any subject they like from a list. This past Friday, March 25, 2016, marked the day on which Christians remember Good Friday (Avak Oorpat). It is the day we remember the last moments of Jesus’ life. He was tortured…bleeding, until he reached his physical end. 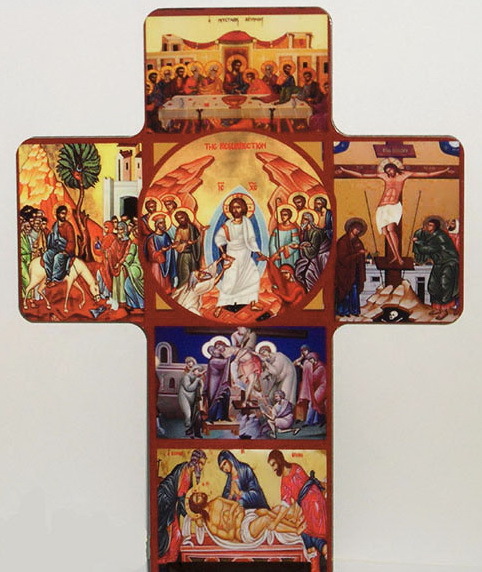 He accepted the whole human nature and became God and human at the same time, in order to heal the human nature through his Passion, Crucifixion and Resurrection. His Crucifixion was for our sins and in our place, because humanity could not have saved itself from the eternal control of Satan, hell and death. On Saturday, March 19, the younger students of the Kirikian Armenian School participated in pre-Easter festivities. Among other lessons, the children learned about what the color red symbolizes and about Easter traditions as they dyed eggs of their own. We are saddened for the loss of a great church leader, Archbishop Yeghishe Gizirian, senior bishop of the Eastern Diocese of the Armenian Church. May the Lord receive him into the God’s kingdom to dwell in the radiance of our Lord for all eternity. Several dedicated hard-working ladies gathered today at St. Thomas Armenian Church to prepare for the upcoming 51st Anniversary Palm Sunday Banquet. This year’s Palm Sunday Banquet is sponsored by Haci & Nadya Garipian and Karnig & Ipek Garipian, Chairmen, in memory of their sister, Yeter Cigercioglu.